Additionally, 4Easysoft DivX Converter enables you to convert part video, change video play screen and output effect, add watermark and merge several DivX together and some other professional functions. 4Easysoft DivX Converter, professional DivX Converter, can easily convert DivX video, DivX file to any popular video format you want for you to enjoy DivX movies on your player. Also this DivX Converter supports converting DivX to audio MP3, AAC, OGG, WAV, etc. 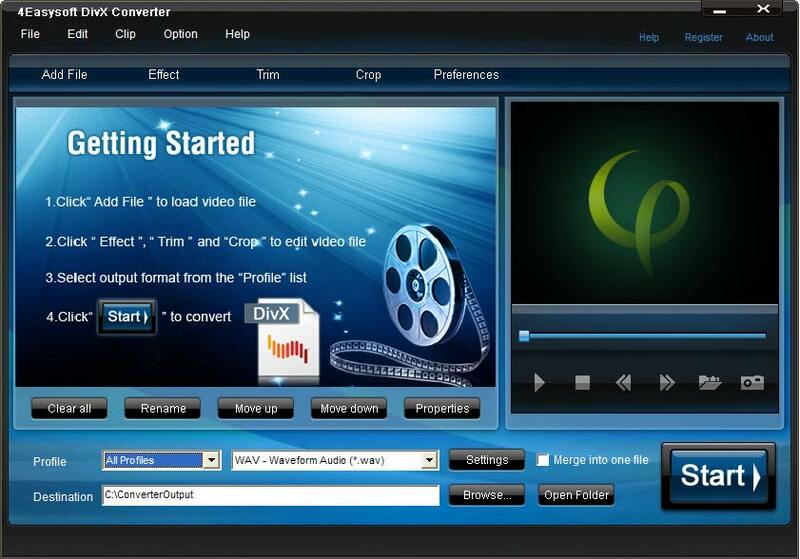 With this DivX Converter, you can convert one DivX file into different output video formats with one time conversion. Use this DivX Converter, you can get any specific part from the source DivX video by setting the start and end time. You can also use this software to merge several DivX together to output one video. To make the output video customized, you are enabled to adjust video brightness, contrast, saturation as well as adding special watermark in the form of text or image. Subtitle and audio track are provided for you to choose for the output video. The DivX Converter has the built-in player, which can help you to preview the source video and converted video freely so as to better optimize the output video. At the same time, you can take pictures of your favorite scene. 4Easysoft DivX Converter is equipped with intuitive interface and advanced technology, which can bring you an easy and fast DivX converting process with best output quality. Attractive Text or Image watermark added on your video. Output several or more kinds of formats from the same source content. Select your subtitle and audio track according to your own need.